Amino AcidsScitec G-BCAA - 250 kaps. Scitec G-BCAA - 250 kaps. The product is a concentrated source of branched chain amino acids. Branched chain amino acids build approx. 1/3 of skeletal muscle mass, they have anticatabolic effect, and play an important role in muscle protein synthesis. 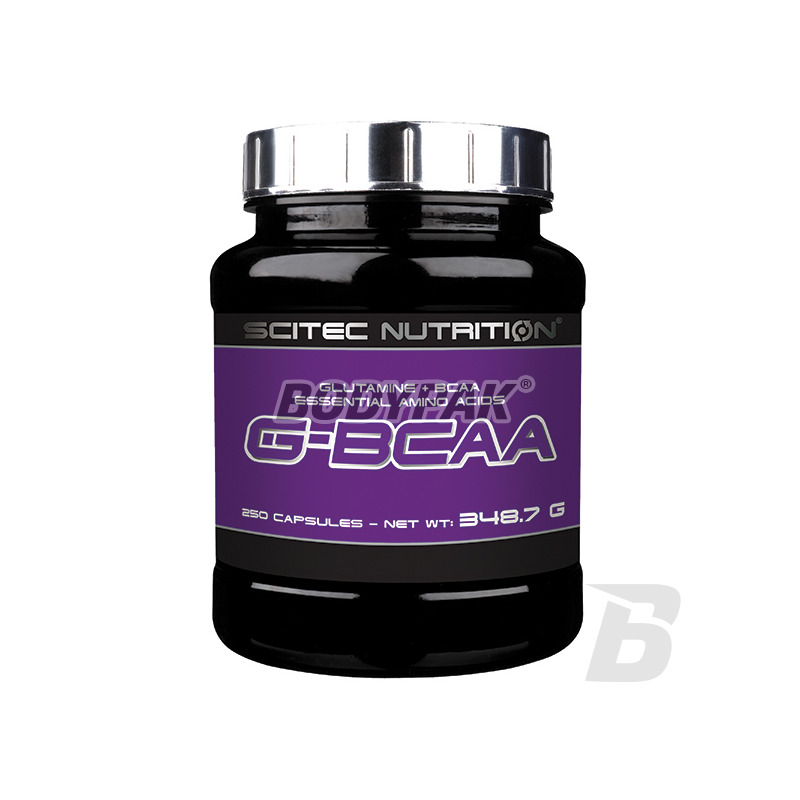 Scitec G-BCAA is a concentrated source of branched chain amino acids. Branched chain amino acids build approx. 1/3 of skeletal muscle mass, they have anticatabolic effect, and play an important role in muscle protein synthesis. 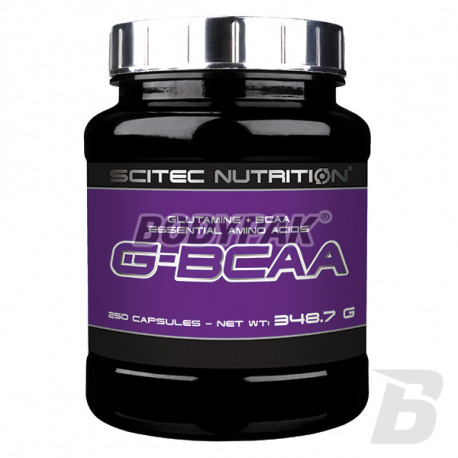 Scitec G-BCAA is ideal for people who want to increase muscle mass and strength without adipose tissue increase. G-BCAA contains up to 5 g of branched chain amino acid in a ratio 2: 1: 1. The preparation is additionally intensified by L-glutamine - an amino acid important to protein biosynthesis, as well as increasing muscle strength and endurance. Składniki: L-glutamina, L-izoleucyna, L-leucyna, L-walina, żelatyna wołowa, barwnik (dwutlenek tytanu, czarny tlenek żelaza, indygotyna), substancja glazurująca (szelak). Bardzo dobrej jakości BCAA z dodatkiem glutaminy! Advanced product amino acid for use in the area of training. It provides better regeneration after training, but also inhibits catabolism and accelerates the rate of anabolic! A high concentration of active ingredients (including vitamins) in each portion. Refined taste and solubility! An effective nitric oxide (NO) capsule - go for it if you want to pump your pump in training! A solid dose of arginine in each serving. It has a positive effect on post-exercise regeneration. The highest quality at your fingertips! Supplement based on carefully balanced proportions of branched chain amino acids: isoleucine, leucine and valine. Reaching for the product to choose the highest quality, which has been confirmed by many athletes! Protect your muscles from breakdown! NOW Foods L-Methionine 500mg - 100 kaps.